This project is a collaboration between GeoModelling Solutions GmbH, Volcanic Basin Petroleum Research AS and the Iceland GeoSurvey. The goal is to develop a large scale thermal model that deals with how ridges, transforms, and the Iceland hot-spot have affected the Jan Mayen Microcontinent (JMMC). Building up on a tailored 3D finite element method model, we create more realistic boundary conditions for the maturation model. This study will address major questions in regards to the magmatic evolution for the southern extent of the JMMC, as they are poorly constrained, and the interplay of different rifting and magmatic episodes on the thermal state of the JMMC crust that remains unclear to date. 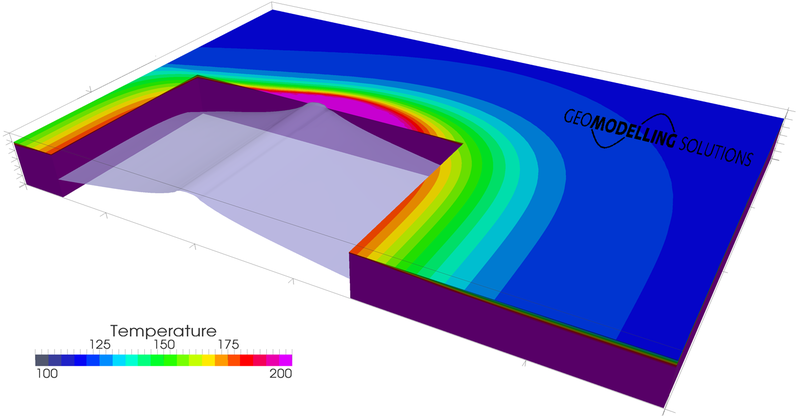 Custom 3D finite element model showing the thermal influence of a moving ridge on nearby sedimentary basins which is important for breakup and transform systems.